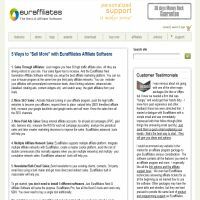 EurAffiliates is a next-generation affiliate management software package that aims to give new and experienced affiliates alike all of the tools and features they need to run a successful affiliate scheme. Although this software package doesn’t quite make it into our top ten in this category (there’s a lot of competition from some great products), we do think it has something to offer to those wishing to improve sales of a particular product or whole business, or for those interacting with an affiliate scheme as a member or manager. What’s more, as there’s no monthly fee (only a one-off installation charge), it’s more affordable in the long run than many alternatives in the market. This software package is available in a “one-install” package (as opposed to many software options in this category that are charged on a monthly-subscription basis), meaning once you’ve installed the product you can immediately begin tailoring its features to the particular needs of your business and program. Multiple level administration access is available, letting managers control the information that various users can have access to and streamlining affiliate payments. The software also boasts reliable four-tier tracking of affiliate links using cookies, session tracking, IP address recording and customer reference numbers – meaning you never lose track of a sale or lead! Although we did think there were a number of positive elements to EurAffiliates and many features we think our readers would find useful, the software doesn’t quite stand up to the competition in this category. Where other services offer extensive reporting and analytics tools and communication features that make managing an affiliate scheme easier and more successful, EurAffiliates' collection of features is more streamlined and doesn’t offer as many options in this respect. That said, this software is considerably cheaper than many of the tools we have reviewed in this category, coming in at just $249 (one-time-only payment), so it could still be worth a try if you’re looking for a budget-friendly solution. Although our review of this product isn’t wholly positive (nor did it make it into our top ten in this category), we still think it has a lot to offer. One of the best features of EurAffiliates is the one-month free trial, which gives users the chance to test out all of the product’s features without having to pay a single penny. If you’re looking for a scalable, flexible affiliate management solution that won’t break the bank, look no further – EurAffiliates could well be perfect for you.